Sulemani Keeda – Most Parts Funny, Some Parts Poignant, All Parts Extraordinary! The opening credits of Sulemani Keeda is a set of disjointed montages that scream reality mired in eclecticism, where stacks of books find place alongside a figure of Obama, portraying the global consciousness we all strive to attain. Sights of a typical bachelor pad, traces of alcohol, two boys lying in a state of possible drunken stupor, a phone conversation that you’ve probably already been privy to – you surmise that if nothing else, this movie isn’t going to show you elaborate sets, fancy costumes & usual Bollywood plot points. 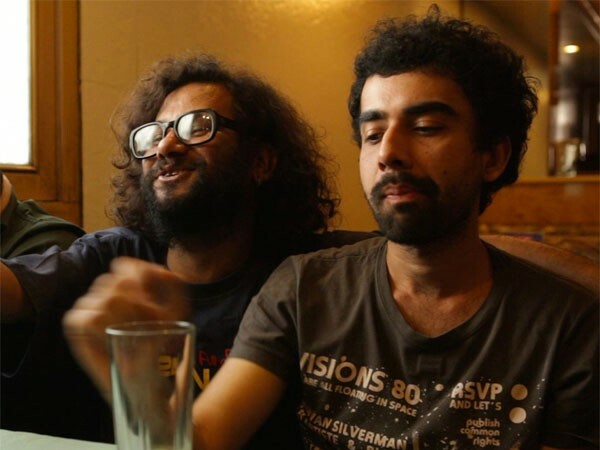 Sulemani Keeda is the tale of Mainak (Mayank Tewari) & Dulaal (Naveen Kasturia), two aspiring scriptwriters waiting for their big break in the dog-eat-dog world of Bollywood. A story set against the backdrop of urban Bombay, rife with open-mic nights, meetings with Bollywood big-wigs, bird-watching trips to Sewri, house parties, getaways to Lonavla, walks along Marine Drive and Juhu Beach, Sulemani Keeda is a mirror image of our everyday lives. Everything about the movie portrays an element of kitschy realism. The phone call, introduction of Mainak and Dulal, their visit to a book store subsequently after, introduction of the female lead Ruma (Aditi Vasudev) who catches Dulal’s fancy few scenes later, Sulemani Keeda is a juxtaposition of familiar settings made memorable owning to the witty dialogues delivered with the most perfect comic timing. Dulal is the passionate bibliophile, the poet, the emo-sentimental one, the quiet guy at the house party who shines only when you bother engaging him in a one-on-one conversation. Mainak is the polar opposite, verbose, brash, politically incorrect, opinionated and eternally optimistic. Together they make for the perfect duo, one’s sensitivity playing the ideal foil to the other’s lack of brevity. Mainak and Dulal spend days circling the houses of directors, actors and film studios but without luck. There are some hilarious scenes with the likes of Mahesh Bhatt and Anil Sharma playing themselves eliciting sufficient laughs from the already rib-tickled audience. Gonzo, son of famous yesteryear, commercial Bollywood film-maker Sweety Kapoor, becomes the last straw to these two floundering souls. Despising his father’s inane pot-boilers, Gonzo is a self-confessed connoisseur of world cinema, of communism; his cat is called Fellini inspired from the eponymous Italian film director. Pseudo-intellectual Gonzo has been waiting for years for that perfect art-house magnum opus befitting his supposed super-stardom. 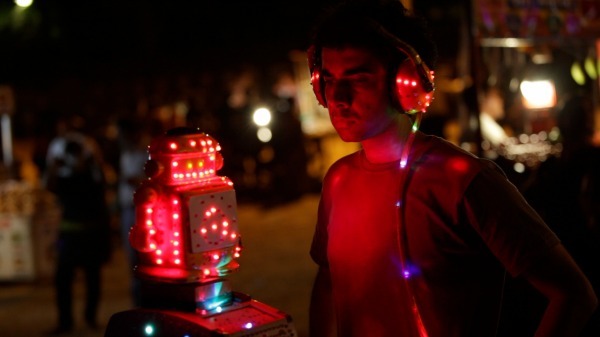 Gonzo, Mainak and Dulal form a trio to ensure this project sees the light of day, only spanner in the works being Gonzo’s abject lack of knowledge about the nuances of film-making. Dulal and Ruma have, in the meantime, started getting closer with Dulal’s affection for her on an exponential rise. In the end, Gonzo’s stupidity, Dulal’s lovesickness and Mainak’s desperation to make his first movie bring forth a climax that is not unpredictable but is one you surely hope for. It’s guided by the same desire to not give into melodrama that binds this heartfelt work of art from the very start. There are beautiful shots of Dulal and Ruma’s exchanges interspersed with intelligently penned dialogues. Yes, it is the sceenplay and the dialogues that are the heroes of Sulemani Keeda. Ofcourse, one must mention the cinematography and Director Amit V. Masurkar’s ability to elicit effortless performances from each of his actors. The simple yet impactful background score coupled with wonderfully rendered songs deftly amplify the charm of each scene. Made on a budget of 30 lacs, Sulemani Keeda is one of those movies that prove you don’t need big monies to skillfully narrate a tale. What you need is vision, a great script and a few good men armed with conviction to help you realize your labor of love.